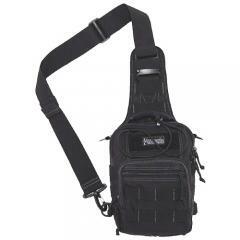 The Maxpedition Remora is the smallest model in their popular line of Gearslinger single-shoulder bags. It can be used as a stand-alone bag for light travel, or attached to a larger bag using SlikClips. The interior compartment and the padded exterior rear pocket both contain hook and loop fields that can support a concealed carry holster. Multiple internal pockets make it easy to organize your gear for rapid accessibility. The exterior of the bag features multiple areas of PALS webbing, allowing you to attach accessories as needed to suit your mission parameters. The removable quick-release shoulder strap makes the bag comfortable to carry, and the lower clip can be attached to either side of the body for ambidextrous wear.